Bobbex Deer Repellent is an original, unique spray made from all natural and recycled ingredients. It is applied directly on the surface of foliage to repel deer. It is readily diluted in water. Bobbex is environmentally compatible and harmless to all wildlife including humans, pets, birds and aquatic life. This ready-to-use formula comes with its own trigger sprayer. 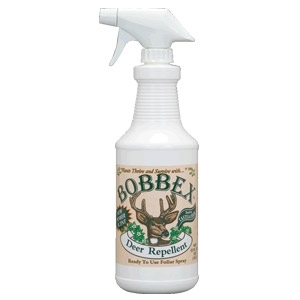 Bobbex Deer Repellent is the most effective long lasting spray on the market. Bobbex is environmentally compatible, using only natural ingredients that stop deer browsing by using multiple smell and taste deterrents and WILL NOT WASH OFF. Bobbex can be used on all ornamental shrubs and flowers, and around vegetables.